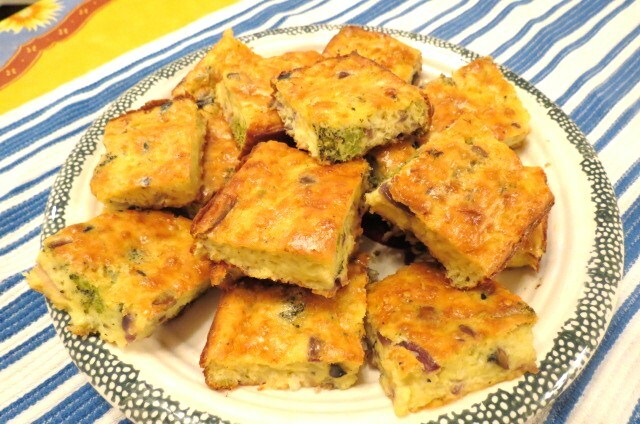 UPDATE – – Cathy from Australia told me she prepared Crustless Quiche Squares BUT she substituted cooked bacon for the broccoli. I love that idea! 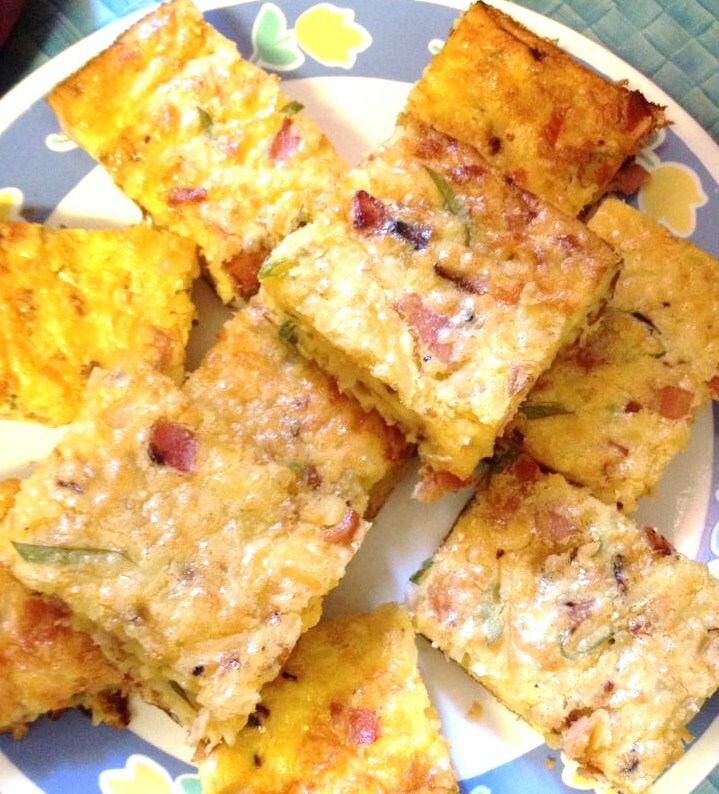 Cathy calls them Bacon and Egg Squares and said they were a big hit with her four daughters! When my twin sons were teenagers I had a repertoire (of sorts) featuring things they could ‘Grab ‘n Eat’ – and by ‘they’ I mean my sons and their multitudinous friends … all of whom seemed to have bottomless stomachs. Crustless Quiche Squares are a bit more ‘solid’ than most quiches due to the addition of a bit of flour, which is why they’re so easy to ‘grab and eat’ either for breakfast (as I did today), for a packed lunch or to serve as appetizers. And they’re equally delicious eaten right from the fridge or at room temperature. ++ Today I made a smaller version of the original recipe, which works well for someone like me who doesn’t need to feed lots of teenagers! That recipe follows the larger yield recipe below. ++ Oven temperature changes – – Bake at 400F for 15 minutes, … then lower to 350F for 30 – 35 minutes. In a large bowl, beat 10 eggs with an electric mixer for about a minute. Set aside. In a large skillet, over medium heat, melt 1/3 cup butter. Add 2 medium Bermuda onions, sliced; 1 1/2 cups chopped mushrooms and 1 1/2 cups chopped broccoli. Cook, stirring occasionally, for 15 minutes. Set aside. Add 1/2 cup flour, 1 tsp. baking POWDER and 1/3 tsp. salt to the previously beaten eggs until combined. Add 1 lb. small-curd cottage cheese and 1 lb. grated Monterey Jack Cheese and beat until combined. 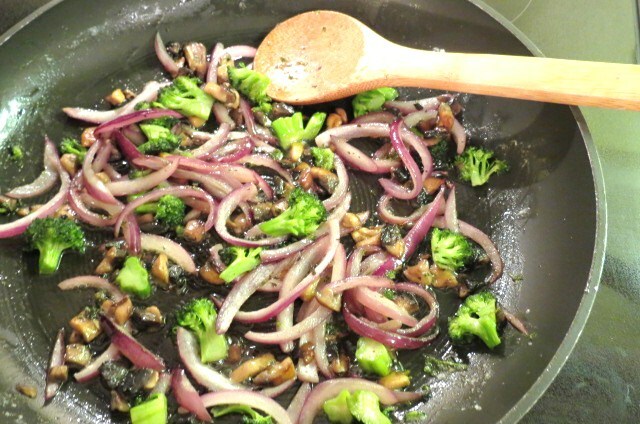 Add sauteed onions, mushrooms and broccoli. Again, beat until combined. Pour into greased 13′ x 9′ pan. ++ Bake at 400F for 15 minutes………then REDUCE HEAT to 350F for 30 – 35 minutes. Crustless Quiche Squares should be light brown when fully cooked, and a knife stuck in the middle shouldn’t stick. Enjoy! ++ Oven temperature changes – – Bake at 400F for 15 minutes, … then lower to 350F for 23 – 25 minutes. In a large bowl, beat 5 eggs with an electric mixer for about 30 – 40 seconds. Set aside. In a large skillet, over medium heat, melt 1/4 cup butter. Add 1 medium Bermuda onions, sliced; 1/2 cup chopped mushrooms and 1/2 cup chopped broccoli. Cook, stirring occasionally, for 15 minutes. Set aside. Add 1/4 cup flour, 1/2 tsp. baking POWDER and 1/4 tsp. salt to the previously beaten eggs until combined. Add 8 oz. (1/2 lb.) small-curd cottage cheese and 8 oz. (1/2 lb.) grated Monterey Jack Cheese and beat until combined. Pour into greased 9” x 9′ pan. ++ Bake at 400F for 15 minutes………then LOWER HEAT to 350F for 22 to 23 minutes. Next Post Livin’ The Life!! Hi Judy! And these quiche squares a bit more solid than most quiches… which made them very popular with my teenage sons and their friends, who loved to ‘grab & go’!! Quiche is so easy to make and as you point out, so easy to take with you too. Good one! Hi EllaDee – you’re right – these are very much like Impossible Pie. I remember when all those ‘Impossible Pies’ were so popular. I’ll have to remember to make one of those sometime soon. Hi Carol – I have no idea why I just found your comment!! Thanks for visiting and I promise to reply quicker next time! Perfect to serve as part of an Easter brunch. An excellent analogy my friend!! I always liked the Frugal Gourmet’s recipe because they’re simple, easy and damn tasty!! Love the way you think my friend! On another note – the other day I came across a photo you had sent me of your version of my ‘Easy Cheesy New Potatoes’. I really like your idea of adding broccoli to the dish – I don’t know why it took me so long to realize I should include your photo ’cause it looks so delicious! 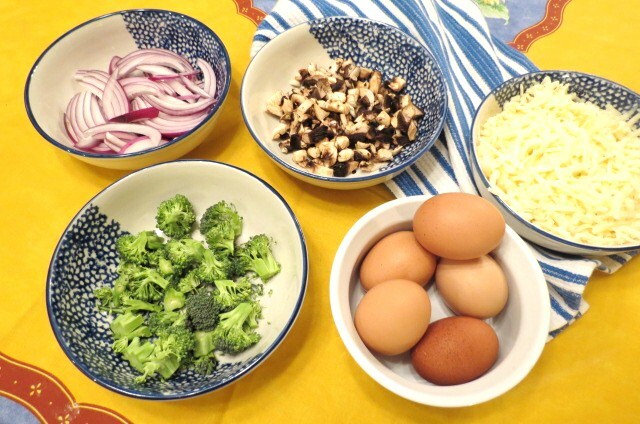 So, a few days ago I posted the photo, as well as your idea of adding fresh broccoli and radishes – plus a link to your blog. I’d definitely grab one and go.. and them come back 8 more times! Thanks Liz!! I, too, really love broccoli – not that I loved the broccoli my mother used to cook which was soggy, smelly and nasty! I sometimes stir-fry chopped broccoli and pour spaghetti sauce and meatballs over it. It’s yummy !! If you like broccoli, try this spicy/sweet roasted version. You don’t need to add the glass noodles or the bbq’d pork if you don’t want to. Thanks – the recipe looks very good. I’m going to Pin It !! Nobody ever taught our mothers about the need for veggies to have a crunch …I love my veggies crunchy, my mother would describe that as “raw” ha ha! I remember when I was first married – cooking broccoli in a lot of water (and for far too long) like my mother. The color of the broccoli was nasty and the kitchen ended up smelling like an outhouse. What a terrible thing to have done to such a great vegetable!! My father always made us clean our plates but he never made us eat broccoli if we didn’t want to ’cause he didn’t like it either! I bet he’d like broccoli the way we cook it now! I love the ingredients you add and also love that its easy to make. I can have this for a light lunch or even breakfast. Thanks for sharing. Broccoli is one of my most favourite veggies! I love this idea. It’s a portable breakfast, snack, appetizer… Anything you want to make it. Plus it looks really tasty. Forgot to say – I really like your idea of serving these as part of a brunch or a buffet!! Great idea. 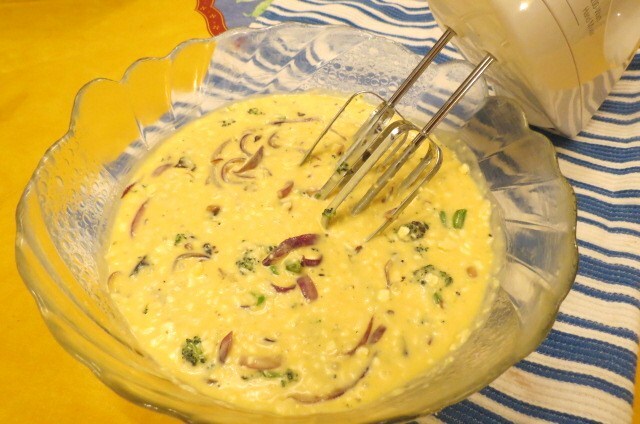 Reminds me of a ‘magic’ quiche recipe that I have … no crust and some flour in the batter. Lots of spinach too. I really like the cottage cheese you used. Thanks! I’m eating some right now for breakfast – yummy!